Victory – Amati model ship kits are manufactured in Torino Italy. Amati was founded in the 1920’s on the principle of old world craftsmanship. 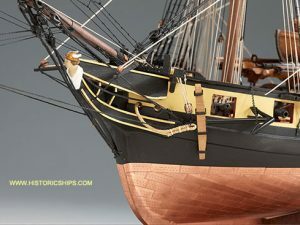 Victory – Amati model ship kits are accurately detailed, faithful renditions of the original vessels. Materials are the finest available, plans and instructions are excellent, and presentation is beautiful. In recent years, Victory – Amati has taken full advantage of computerized design and modern materials to enhance its products. This combination of traditional quality and the latest technology has made Victory – Amati not only Italy’s oldest, but also most innovative manufacturer. All Victory – Amati model ship kits come with everything you need except for tools, paint and glue.